Aim: The aim of this study was to determine the most common allergens that cause sensitization in skin prick tests (SPTs). Subjects and Methods: The data for this retrospective cross-sectional study were collected from results in 180 patients referred to our clinic with allergic rhinitis (AR), asthma, or atopic dermatitis (AD). All participants underwent SPT during 2013–2015 in our clinic at University Hospital Sharjah. SPT was performed with 15 aeroallergens selected based on the most common identifiable allergens in the region. A mean wheal diameter of at least 3 mm greater than the negative control was considered positive. Statistical analysis was done through SPSS 21. Results: The patients' ages ranged from 12 months to 16 years. About 69.4% had AR, 52.2% had asthma, and 21.1% had AD. Among positive patients, 89.4% were polysensitized and 10.6% were single sensitized. House dust mites (HDMs) yielded the highest prevalence of sensitization, followed by cat dander and feather mix (both 17.2%). The least common of all indoor aeroallergens was cockroach (8.9%). Molds yielded the following sensitization rates: Alternaria alternata 26.1%, Cladosporium mix 20.00%, and Aspergillus mixture 17.8%. Among outdoor allergens, sensitization rates were 21.1% for Phleum pratense, 17.2% for Russian thistle, 14.4% for Chenopodium album, and 10.0% for date palm. The least common outdoor allergen was Bermuda grass with a percentage sensitization of 5.6%. Conclusions: The most common aeroallergens identified by SPT in our allergy clinic were HDMs in all allergic diseases, which is consistent with results from similar studies in our region. The most common allergic disease in our population was AR. The prevalence of allergic diseases has been rising dramatically in the past several decades, adding a new burden to global public health. These diseases include allergic rhinitis (AR), asthma, atopic dermatitis (AD), anaphylaxis, acute urticaria and angioedema, food allergy, insect venom allergy, latex allergy, and some drug allergies. Identifying these allergens has diagnostic and therapeutic benefits for both patients and the health-care system. To confirm the presence of allergy, the most common diagnostic procedures are the IgE specific test, food challenge test, and skin prick test (SPT), which are done according to the patient's history of aeroallergen sensitivity. The aim of this study was to evaluate the prevalence of SPT positivity to various aeroallergens in children with allergic diseases in Sharjah. This is the first study to be conducted in children (aged 12 months to 16 years) in this area. The participants in this cross-sectional study were pediatric patients with allergic diseases who presented to the asthma and allergy clinic at University Hospital Sharjah with a diagnosis of AR, asthma, or AD between February 2013 and December 2015. All patients were referred to us for confirmation of allergy and appropriate treatment. Data were collected from the results in 180 patients who underwent SPT at the clinic during the study period. All patients were tested with a panel of 15 allergens chosen as common identifiable allergens in the region according to the World Allergy Organization: 2 mite species (Dermatophagoides farinae and Dermatophagoides pteronyssinus), 3 mold species (Alternaria alternata, Cladosporium mix containing Cladosporium cladosporioides and Cladosporium herbarum), Aspergillus mix (Aspergillus fumigatus, Aspergillus nidulans, Aspergillus niger), 2 weed species (Chenopodium album [fat hen] and Salsola kali [Russian thistle]), 2 grasses (Phleum pratense and Cynodon dactylon), tree pollen from date palm (Phoenix dactylifera), cat dander, feather mix (duck, goose, hen), rabbit and horse hair, and cockroach (Blattella germanica). The SPT was performed according to European guidelines by a single trained individual. Parents were asked to stop antihistamine medication and to avoid using steroid creams on their child's forearms for 1 week before testing. Histamine hydrochloride 10 mg/mL and phenolated glycerol-saline solution were used as positive and negative controls, respectively. Stallerpoint pricks (Antony, France) were used to place the allergen drops spaced 2 cm apart, and the tests were read after 15 min. A positive SPT was defined as a mean wheal diameter at least 3 mm greater than the negative control. A child was considered to be sensitized if the SPT test was positive. All allergens were from Stallergenes and Greer (Antony, France). The statistical analysis was done with SPSS software version 21, (IBM, New York, USA) to find the percentages of common allergens. This study was approved by the hospital ethics committee. The study included 180 patients who underwent SPT at the allergy clinic of University Hospital Sharjah. The age of the population that we studied ranged from 12 months to 16 years. One hundred and twenty-three patients were below the age of 7 years, while 57 were 7 years old or older. One hundred and seven patients were males, and 73 were females. The study population demonstrated variable presentations of allergic diseases. The most common allergic disease was AR, present in 69.4% of the population, followed by asthma symptoms in 52.2% and AD IN 21.1% [Figure 1]. Among those who were positive for aeroallergens, 89.4% were polysensitized and 10.6% were single sensitized. The most prevalent indoor aeroallergens were D. farinae (38.3%) and D. pteronyssinus (37.2%), followed by cat dander (17.2%) and feather mix (17.2%). The least common allergen was cockroach (B. germanica) (8.9%). Alternaria (26.1%) was the most common outdoor allergen, followed by P. pratense (21.1%), Cladosporium mix (20.0%), S. kali (17.2%), Aspergillus mix (A. fumigatus, A. nidulans, A. niger) (17.8%), C. album (14.4%), date palm (10.0%), and Bermuda grass (C. dactylon) (5.6%) [Table 1]. The pattern of sensitization did not vary according to age, as we found that house dust mite (HDM) sensitization was the most prevalent allergen in patients both younger and older than 7 years. Among patients with AR, the most common allergen was HDM, followed by Alternaria, cat dander, and weed [Figure 2]. HDM was also the most common allergen in patients with asthma symptoms, followed by Alternaria, P. pratense, and Cladosporium mix [Figure 3]. A very high percentage of patients with AD were sensitized to HDM, followed by feather mix, A. alternata, and S. kali [Figure 4]. Sensitization to aeroallergens is the most important cause of symptoms in people with AR and asthma, yet many studies have shown that the distribution and pattern of allergy differ significantly from one country to another. Identifying common allergens in local populations is important for diagnosis and targeted specific therapy, and to the best of our knowledge, this is the first study to be conducted in the pediatric population in the Emirate of Sharjah. We also wished to identify a common aeroallergen panel to be used in children with AR, asthma, and AD. The prevalence of AR in young children (6–13 years) in the United Arab Emirates (UAE) was reportedly 22.9%, and a more recent study of adult and adolescent populations (13–19 years) reported AR prevalences of 32% and 41%, respectively, indicating that AR prevalence has increased. 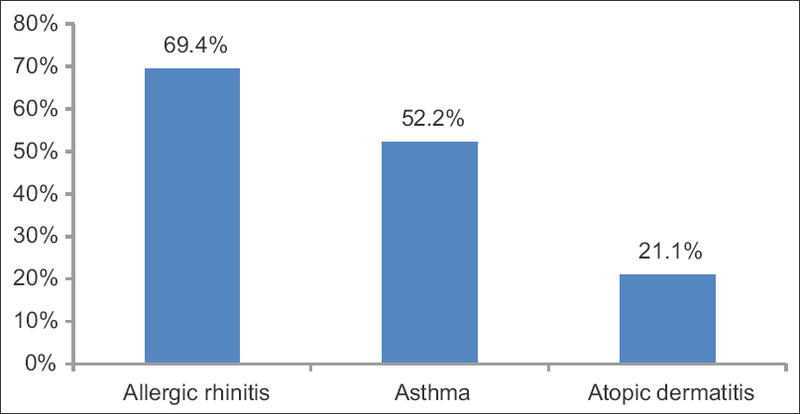 In our sample, AR was the most common presentation of allergic disease in 69.4% of patients, compared to asthma in 52.2%, followed by AD in 21.1%. 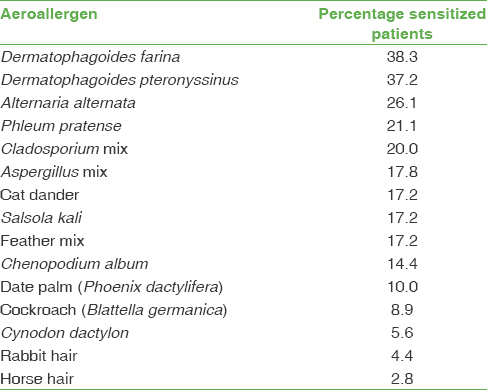 The most common aeroallergen identified in our study was HDM (D. pteronyssinus 38.3%, D. farinae 37.2%). This result is consistent with a study in the UAE and Saudi Arabia, where the rate of HDM sensitivity was reported as 46% in Abu Dhabi, although much higher rates were reported in Khartoum, i.e. 72% for D. pteronyssinus and 60% for D. farinae. The city of Sharjah is located along the southern coast of the Arabian Gulf and on the Arabian Peninsula; its hot, humid climate provides ideal conditions for HDM propagation. Al Ain city, known as the garden city of the UAE due to its abundant ornamental trees and plants, enjoys much milder temperatures. Yet the prevalence of HDM sensitivity in Al Ain city has increased steadily in recent years from 17.1% (249) in 2000 to 46% in 2012. This may be explained by changes in lifestyle, modernization, and substantial environmental changes in the UAE. A study across all emirates in the UAE reported that only 47% of the population made an effort to minimize exposure to HDM, a common trigger that worsens nasal symptoms. Sensitivity to HDM is highly prevalent in this region; therefore, it is important not only to identify HDM sensitivity but also to provide appropriate advice to patients. The identification of HDM sensitivity is important in children with allergic disease, as it has been shown to be the most common indoor allergen associated with asthma worldwide. In our patients with asthma, it was the most common indoor allergen: the prevalence of sensitization was 39.4% for D. pteronyssinus and 36.2% for D. farinae. A similar population in SA reported a much higher HDM sensitivity. AD and sensitization to food and inhalant allergens are both common in early childhood. The prevalence of AD in UAE children is 11%. In our participants with AD, the most prevalent allergen was HDM. This is consistent with regional and international studies that reported high prevalences of HDM sensitivity in children with atopy and AD. Cat dander is a major source of allergic sensitization worldwide. The prevalence of sensitization to this allergen in the UAE was previously reported as 4.9% in patients with allergic disease and 9.4% in another study;, a more recent study in Al Ain reported the prevalence as >20%. One could speculate, therefore, that sensitivity to cat dander aeroallergen in the UAE is increasing steadily compared to the results of previous studies. Cat dander is an important aeroallergen in the region. The prevalence of sensitivity to cat dander in our patients (17.2%) was much lower than in the Jordanian population (41.6%). Cockroach allergen (B. germanica), recognized as a perennial allergen, was the least frequent indoor allergen in our study, with a sensitivity rate of 8.9%, which was <14.7% rate reported in Al Ain. Higher sensitivity rates were found in nearby countries such as Iran (21.4%) and Oman (32.1%). Mold and pollen are the two major classes of clinically relevant outdoor aeroallergens. Alternaria and Cladosporium are universally dominant outdoor fungal species that can be detected indoors, while Penicillium and Aspergillus are universally dominant indoors. Studies have demonstrated that sensitization to fungi such as Alternaria is strongly associated with AR and asthma in Saudi Arabia. In our population, Alternaria sensitivity was the most frequent among the fungal allergens we tested for, followed by Cladosporium and Aspergillus mix. Other studies in the region reported Cladosporium to be the most common airborne fungus in Saudi Arabia, whereas the sensitivity rate to Cladosporium in the emirate of Abu Dhabi was 0%. Children in Kuwait with asthma had the highest rate of sensitivity to mold at 66%, and severe asthma was seen more frequently in patients who were positive to molds than negative to molds. However, the most common molds reported were Candida at 23.1%, Aspergillus at 21.3%, and Alternaria at 14.6%. Among patients in our study with AR and asthma, Alternaria sensitivity was slightly higher in children with asthma (29.8%) than in those with AR (28.00%). Russian thistle (S. kali) is a common weed allergen in our region, and 17.2% of our patients were sensitized to this species. A study in Oman found that 34% of the population with asthma was sensitive to S. kali, and the sensitivity rate was reported as 48.2% in Al Ain. Much higher rates were reported in Kuwait, where 76.7% of the population sample was sensitive to S. imbricata, and in Riyadh, with a 30% sensitivity rate. C. album sensitization was detected in 14.4% of our patients, in comparison to a study in Riyadh, where the sensitization rate to the weed Chenopodium m urale was 24%. According to Western, around 100 grass species are present in the UAE. We included 2 grass species in our allergen panel and found that the most prevalent grass pollen sensitization in our population was P. pratense (21.1%), whereas sensitization to C. dactylon was much less prevalent at 5.6%. Nearby countries have reported higher rates of sensitization to Bermuda grass. In Iran, Fereidouni et al. reported 56.8% sensitization to C. dactylon among patients with AR. In the Kuwaiti population with asthma, the rate of Bermuda grass sensitization was 62.9%, and in a regional study of Middle Eastern and East African countries, the sensitization rates were 18% to C. dactylon and 8% to P. pratense. Although there is a high rate of cross-reactivity between grasses, more of our patients were sensitized to P. pratense pollen than C. dactylon pollen. The most common aeroallergens identified based on SPT sensitivity in the allergy clinic at University Hospital Sharjah were HDMs in all allergic diseases, which is consistent with the results of similar studies in our region. Identifying allergens plays an important role in patient management because it can identify allergens which should be avoided and indicate possible modes of immunotherapy. The most common allergic disease in our population was AR. We thank Dr. Salman Ali Raza for reviewing our manuscript for clarity and language and K. Shashok for improving the use of English in the manuscript. Arshad SH, Tariq SM, Matthews S, Hakim E. Sensitization to common allergens and its association with allergic disorders at age 4 years: A whole population birth cohort study. Pediatrics 2001;108:E33. Heinzerling L, Mari A, Bergmann KC, Bresciani M, Burbach G, Darsow U, et al. The skin prick test – European standards. Clin Transl Allergy 2013;3:3. Regions. Available from: http://www.worldallergy.org/aeroallergens/region-c/middle-east.php. [Last retrieved on 2017 Jul 18]. Alsowaidi S, Abdulle A, Shehab A, Zuberbier T, Bernsen R. Allergic rhinitis: Prevalence and possible risk factors in a gulf Arab population. Allergy 2010;65:208-12. Hasnain SM, Al-Frayh AR, Subiza JL, Fernández-Caldas E, Casanovas M, Geith T, et al. Sensitization to indigenous pollen and molds and other outdoor and indoor allergens in allergic patients from Saudi Arabia, United Arab Emirates, and Sudan. World Allergy Organ J 2012;5:59-65. Räsänen L. Inhalant allergy in the United Arab Emirates. Allergy 2000;55:95-6.
al-Maskari F, Bener A, al-Kaabi A, al-Suwaidi N, Norman N, Brebner J, et al. Asthma and respiratory symptoms among school children in United Arab Emirates. Allerg Immunol (Paris) 2000;32:159-63. Mahboub B, Al-Hammadi S, Prakash VP, Sulaiman N, Blaiss MS, Redha AA, et al. Prevalence and triggers of allergic rhinitis in the United Arab Emirates. World Allergy Organ J 2014;7:19. Nelson HS. The importance of allergens in the development of asthma and the persistence of symptoms. J Allergy Clin Immunol 2000;105:S628-32. Koshak EA. Skin test reactivity to indoor allergens correlates with asthma severity in Jeddah, Saudi Arabia. Allergy Asthma Clin Immunol 2006;2:11-9. Tariq SM, Matthews SM, Hakim EA, Stevens M, Arshad SH, Hide DW, et al. The prevalence of and risk factors for atopy in early childhood: A whole population birth cohort study. J Allergy Clin Immunol 1998;101:587-93. Kokandi AA. Pattern of aeroallergen sensitization in atopic dermatitis patients at university clinic in Jeddah-Saudi. Br J Med Med Res 2014;4:747. Lestringant GG, Bener A, Frossard PM, Abdulkhalik S, Bouix G. A clinical study of airborne allergens in the United Arab Emirates. Allerg Immunol (Paris) 1999;31:263-7. Aburuz S, Bulatova N, Tawalbeh M. Skin prick test reactivity to aeroallergens in Jordanian allergic rhinitis patients. East Mediterr Health J 2011;17:604. Fereidouni M, Hossini RF, Azad FJ, Assarehzadegan MA, Varasteh A. Skin prick test reactivity to common aeroallergens among allergic rhinitis patients in Iran. Allergol Immunopathol (Madr) 2009;37:73-9. Al-Tamemi SH, Al-Shidhani AN, Al-Abri RK, Jothi B, Al-Rawas OA, Al-Riyami BM, et al. The pattern of sensitisation to inhalant allergens in omani patients with asthma, allergic rhinitis and rhinoconjunctivitis. Sultan Qaboos Univ Med J 2008;8:319-24. Hasnain SM, Al-Frayh A, Gad-El-Rab MO, Al-Sedairy S. Airborne alternaria spores: Potential allergic sensitizers in Saudi Arabia. Ann Saudi Med 1998;18:497-501. Hasnain SM, Al-Frayh AS, Al-Suwaine A, Gad-El-Rab MO, Fatima K, Al-Sedairy S, et al. Cladosporium and respiratory allergy: Diagnostic implications in Saudi Arabia. Mycopathologia 2004;157:171-9. Ezeamuzie CI, Al-Ali S, Khan M, Hijazi Z, Dowaisan A, Thomson MS, et al. IgE-mediated sensitization to mould allergens among patients with allergic respiratory diseases in a desert environment. Int Arch Allergy Immunol 2000;121:300-7. Al-Dowaisan A, Fakim N, Khan MR, Arifhodzic N, Panicker R, Hanoon A, et al. Salsola pollen as a predominant cause of respiratory allergies in Kuwait. Ann Allergy Asthma Immunol 2004;92:262-7. Western AR. The Flora of the United Arab Emirates: An Introduction. Al Ain: United Arab Emirates University 188p.-col. illus., maps. En Geog, 2; 1989. Ezeamuzie CI, Thomson MS, Al-Ali S, Dowaisan A, Khan M, Hijazi Z, et al. Asthma in the desert: Spectrum of the sensitizing aeroallergens. Allergy 2000;55:157-62.